... and looky, I wasn't kidnapped! Far from it, actually. Helene (I'm sure you know her already!) and I have known each other for a couple of years now thanks to this crazy little blog universe, and I reckon that I know more about her life than some of my own IRL friends'. Mind-boggling, right? Or should I say, mind-bloggling? Okay, I'll stop. It's late and my mind's gone cuckoo, apparently. Anywhoodles, Helene was in town for a hot second last week, and I couldn't let her slip away without giving her a hug in person! 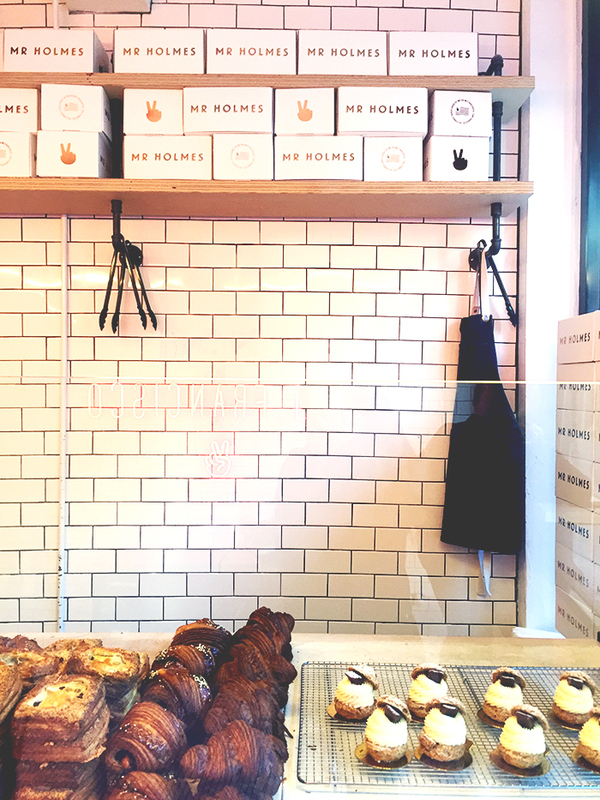 Bright and early on Friday, I raced the sun over to Helene's hotel, fetched her sweet soul, and then together we ventured over to Mr. Holmes Bakehouse, an Instagram icon that I felt was best experienced with an Instagram star in tow. 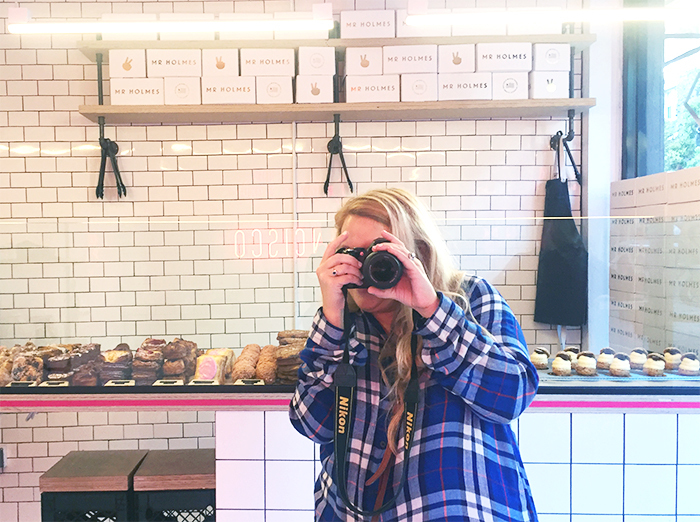 We took our time photographing every inch of the bakery (oh, to be hanging out with another blogger! ), and then on tiptoes, inspected every enticing pastry. 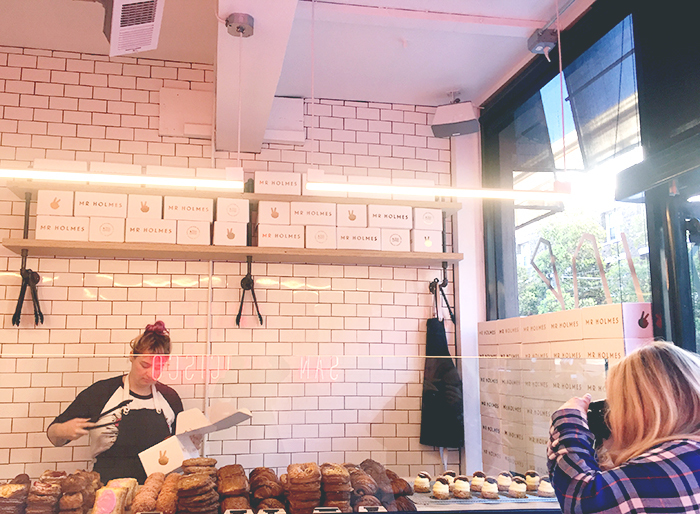 Eventually, we settled on sharing a ham & cheese croissant, a kouign amman, and my personal favorite - a pear cream-filled, sugar-dusted donut! 10/10 would recommend, folks. 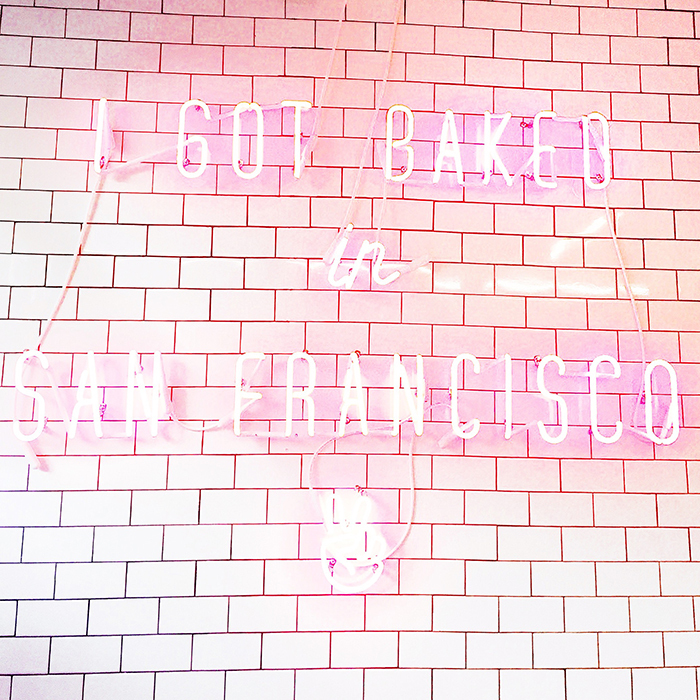 These baked goods are beyond, which is quite the dangerous fact as I can see myself Ubering over for a sweet treat much too often now. She's just as genuine and bubbly and blog-savvy as she comes across on her blog (and Instagram and Snapchat and Twitter and... and, that's as much as I can handle keeping up with at this point #InternetDinosaur). I always find it so refreshing having the opportunity to spent time with fellow bloggers - sometimes, I feel like I'm living a double life, and each time I've met up with a blogger in real life (hi Jordyn and Kelly! ), my love for this community gets validated a smidge more. Chatting about other blogger friends, discussing the quickly evolving world of social media, getting deep into SEO and photography and platforms ... I emerge from these conversations feeling newly inspired and motivated and all, blogging's the BEST EVER! 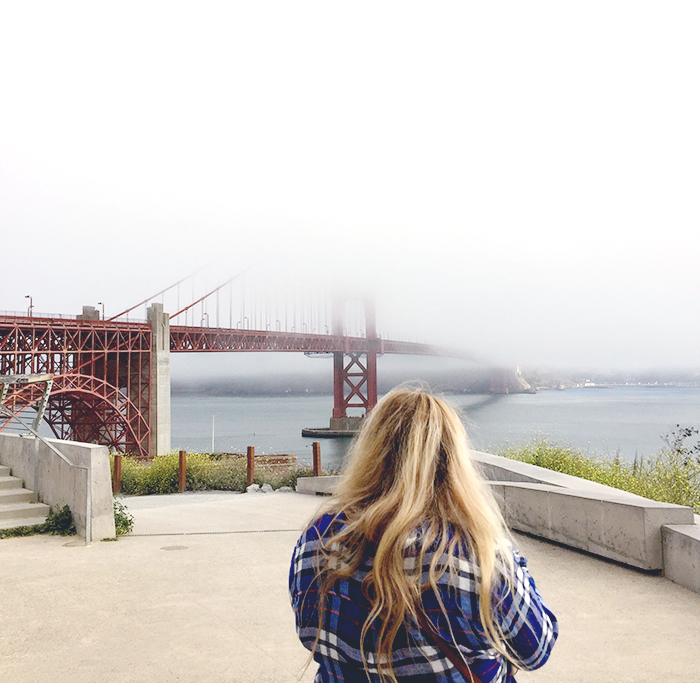 After stuffing ourselves silly with buttery croissants, Helene and I made our way over to the Golden Gate Bridge, who was acting quite shy and hiding behind low-hanging fog. But you know, it made a beautiful scene, regardless. Very on brand, as Helene joked. 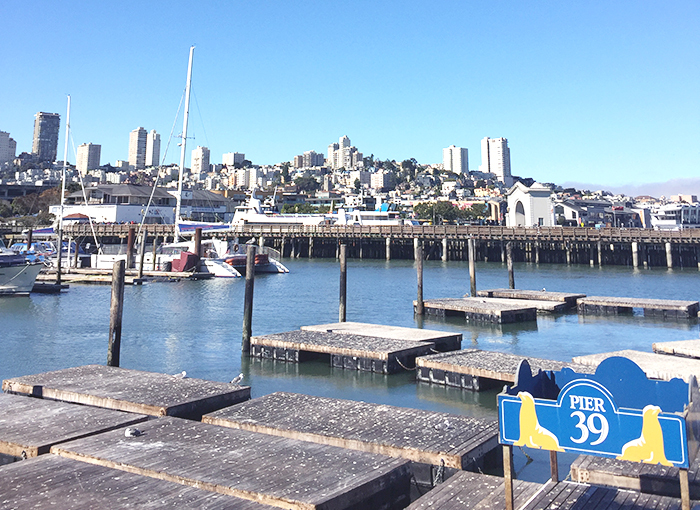 to the charming Pier 39, our final destination. Most of the sea lions were laying low, but the ones who were out were sunbathing and playfully making conversation with the crowd. 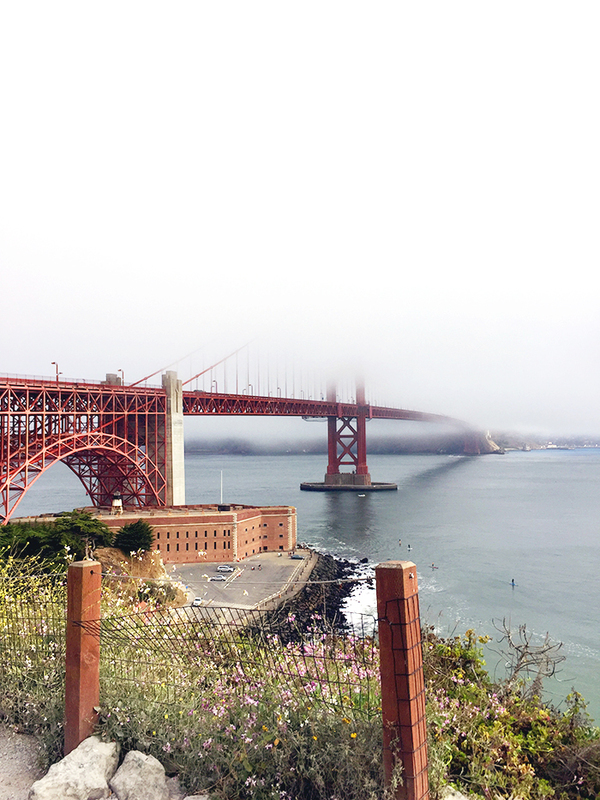 At this point, the sun was out in full force, the water in the bay was gleaming, and San Francisco really started showing off. 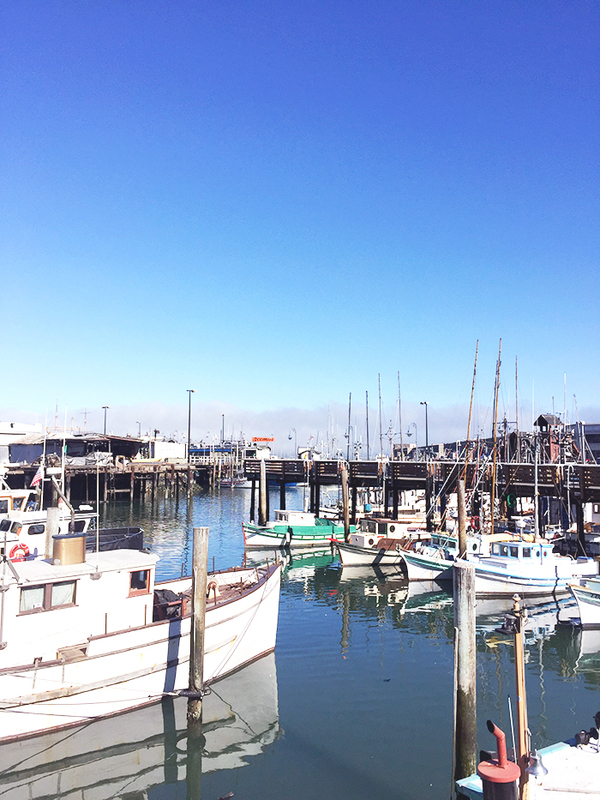 So rare to have such a warm day during our delightfully strange Indian summer! Then, realizing that it was quickly approaching work hours, we said our goodbyes (and Helene sweetly gave me her signature white rug as a parting gift!) and from there, Helene went on to break the Internet at the Daily Tay's wedding with Sarah from Venus Trapped in Mars and I beelined it to much less glamorous work meetings in the Financial District. All in a morning's work! 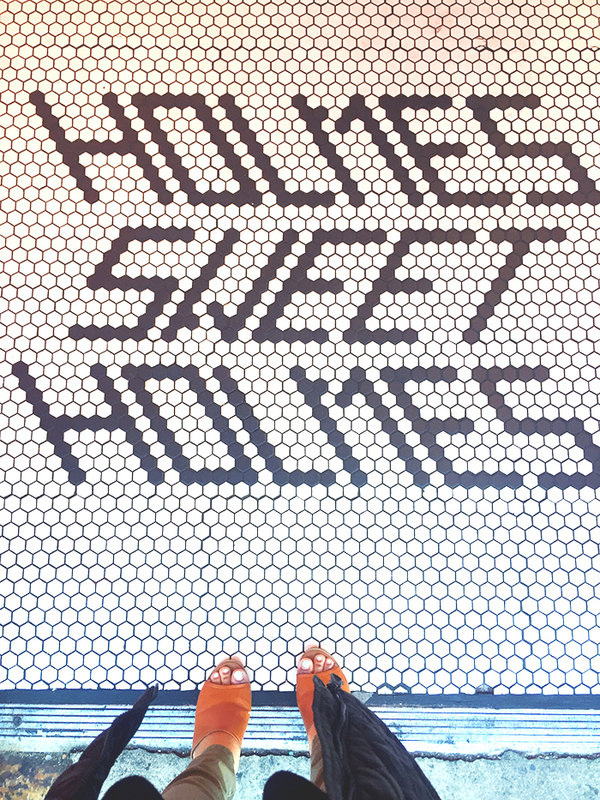 Thanks for hanging out with me, Helene! 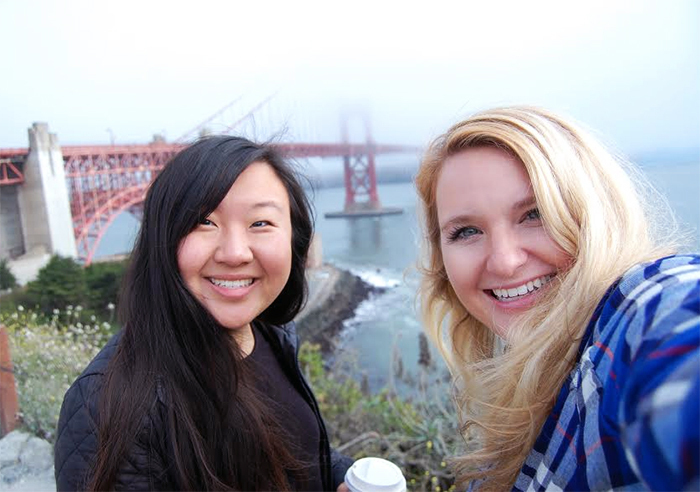 Have you met a blogger friend in real life? Was it everything you expected and more? 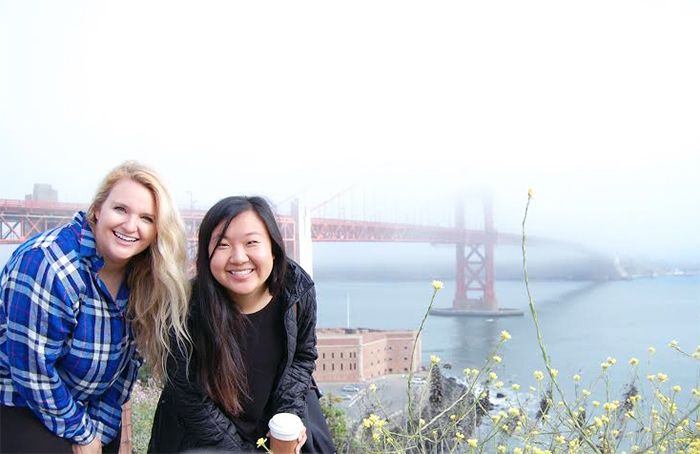 And most importantly, when are you headed to San Francisco so that I can hang out with you as well?! PS. 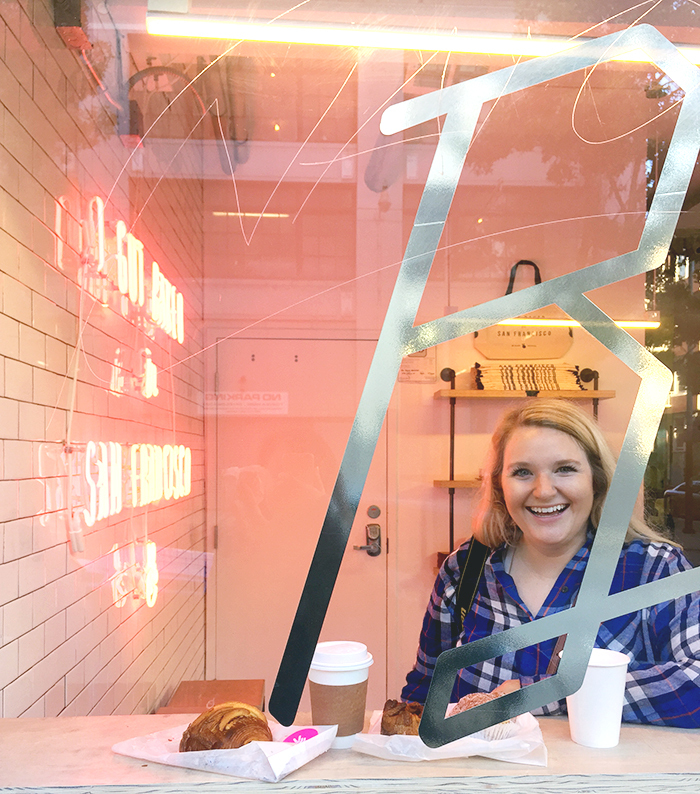 A throwback to brunch and the Guggenheim with Kelly, brunch and exploring Cow Hollow with Jordyn (yes, I really love brunch), and dinner in Seattle with Jordyn! It looks like you guys had such a perfect (and totally Instagram worthy) morning together. 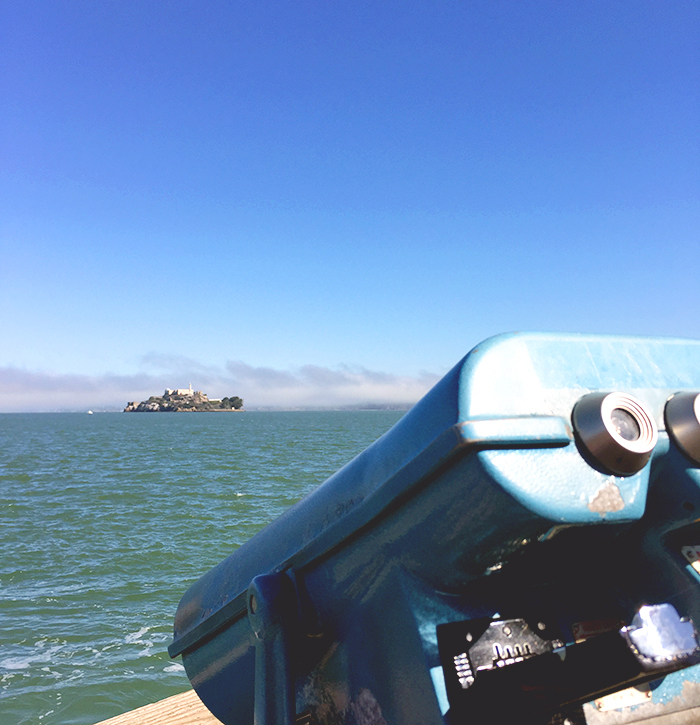 You have me missing San Francisco and definitely wishing for another blog date together! I'm impressed that you fit in so much before work! I feel like I barely have time to get dressed in the mornings! 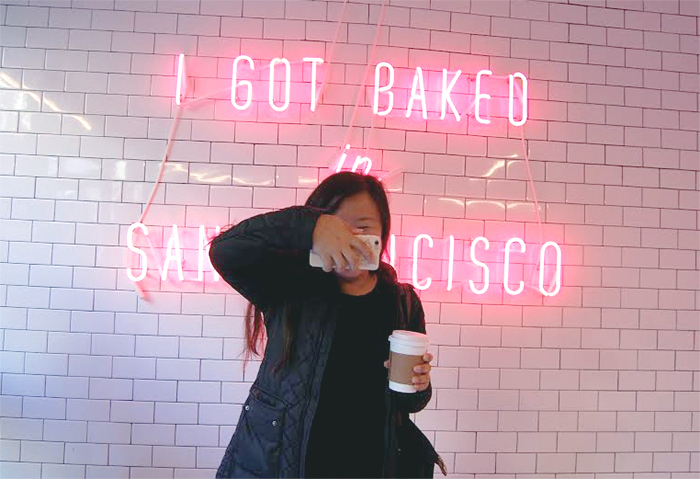 Also, I'm going to have to try that bakery the next time I'm in San Francisco! I can't believe you managed to do all of that before work! Looks like such a fun morning! I have to ask, where is your jacket from? I've seen shorter ones from Burberry, but I haven't seen that length before. 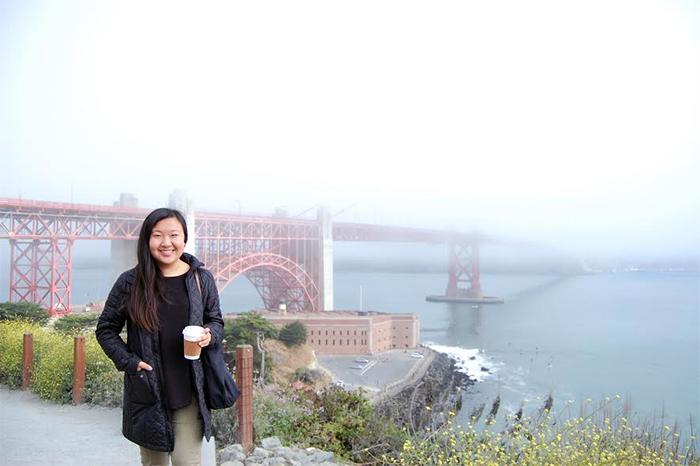 It looks so good on you and seems like the perfect top layer for a foggy SF morning. Wow, how fun! 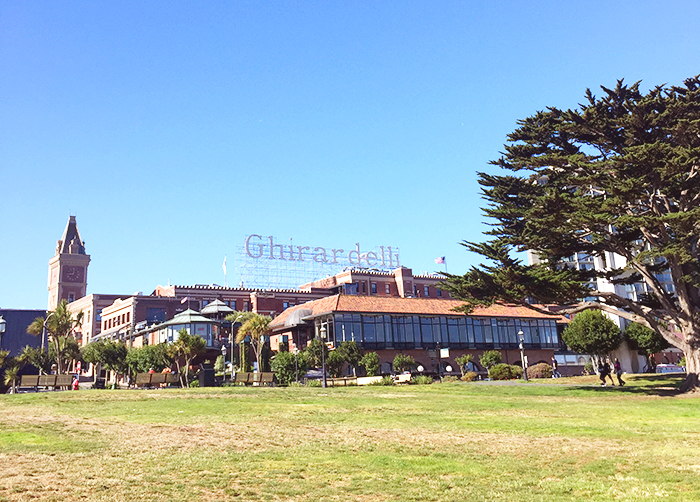 Your photos are drool-worthy. I'd love to have such gorgeous views on the regular. Oh how fun! It sounds like you two had an absolute blast!! I've never been to San Francisco but if and when I do decide to go, I will be sure to hit you up!! Meeting bloggers are always so fun! I was lucky to have met Helene and Sarah up twice. They are such sweet chicas. You make me want to come visit! So glad you got to meet up with a fellow blogger . . . what a cool experience!